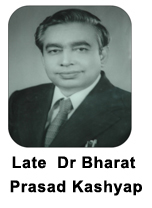 The foundation of this hospital was laid by late Dr Bharat Prasad Kashyap. He was born on 15.1.30. He did his matriculation from Bakshi H. E. School, Husainabad. In first division in 1948. Did his I.Sc. In first division in 1950 from Science College, Patna. Completed his MBBS from Darbhanga Medical College and Hospital in 1955 with honours in Physiology, Eye and ENT. Did his Master of Surgery (eye) from DMCH, Bihar in 1958. Did his D.L.O in 1962 from PMCH, Patna. He was appointed as civil assistant surgeon in 1956. He served in Kuchaikot in 1956. He was appointed tutor in anatomy in DMCH from 26th Jan 1958 to Jan 1959. He was state officer trachoma control pilot project in Bihar and Aligarh in Jan 59 to June 1960. He was in state dispensary, Chakradharpur as Medical Officer from June 1960 to April 1961. He was resident officer in the department of ophthalmology in PMCH from April 1961 to June, 1952. Promoted to Assistant Prof. In R.M.C.H. From June 1962 to August 1965 ophthalmologists do not suffer. He never hesitated in referring the cases to those junior ophthalmologists if some cases came from those localities. He talked very high about the ophthalmologists if the operated cases by them visited Dr. Bharat Prasad Kashyap. He became Associate Prof. In RMCH from 1965 to 1975. He became Prof. And head of the department from 15 Aug 1975 onwards. He left for the heavenly abode on 7th Dec. 1986. The Kashyaps have been pioneers in the field of professional eye care in Eastern India. With a unique legacy of a 50 years and 4 generations of providing quality eye care to the community, Kashyap Memorial Eye Hospital today is a NABH accredited eye super-specialty centre synonymous with state of art equipment and the highest level of professional excellence and ethical values in ophthalmic care. The credit for transformation of The Kashyap Memorial Eye Hospital from an eye clinic established in 1966 by Late (Prof) Dr. Bharat Prasad Kashyap to all new super specialty The Kashyap Memorial Eye Hospital goes to his son Dr Birendra Prasad Kashyap and daughter- in- law Dr. Bharti Kashyap. 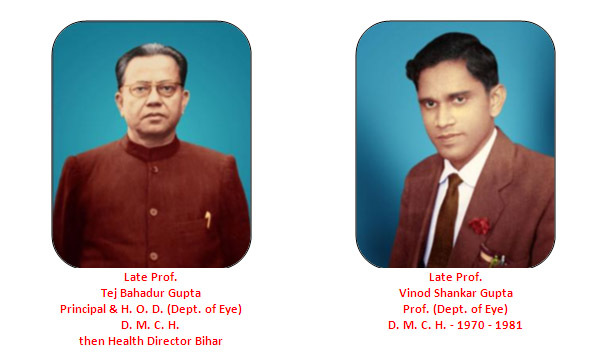 The privileged ancestry of the two founders of the new Kashyap Eye, Dr. Birendra Prasad Kashyap and Dr. Bharti Kashyap traced back all the way to the likes of Late (Prof) Dr. Bharat Prasad Kashyap (Father of Dr. B. P. Kashyap, the then Prof. and H.O.D in RMCH) and Late (Prof.) Dr. Vinod Shankar Gupta (Father of Dr. Bharti, the then Prof. Of Ophthalmology in DMCH). Both Dr. Bharat Prasad Kashyap and Dr. V. S. Gupta were toddlers under Late (Prof) Dr. T. B. Gupta (Grand Father of Dr. Bharti Kashyap) , Fellow of the Royal College of Surgeons of Edinburgh, U.K. who was Prof. and H.O.D of Eye Department in Darbhanga Medical College Hospital and later obliged the prestine list of Director, Health of unified Bihar. This excellence did not stop here as the unstoppable stream of perfection continued to Dr. Bibhuti B. Kashyap, son of Dr Birendra Prasad Kashyap and Dr Bharti Kashyap, a state topper in 10+2 from DPS, Ranchi and an awardee from Syed Sibte Razi, Governor, Jharkhand for his academic performance He has completed his MBBS with eight honourses . He was the only candidate from general category in Bihar & Jharkhand to crack prestigious AIIMS PG entrance examination in 2012. At present Dr. Bibhuti B. Kashyap is pursuing MD in Ophthalmology in R P Center AIIMS. He being the third generation of Kashyap family will further boost the mission of bringing light into the life of deprived ones in and across Jharkhand. The best paper scientific award in the name of Late (Prof) Dr V. S. Gupta for the Ophthalmologists of Jharkhand and Extra mural lecture award in the name of Late (Prof) Dr B. P. Kashyap for the distinguished doctors from outside Jharkhand. Today when Bio-Science is developing leaps & bounds so a Superspeciality hospital was a thing mostly awaited in this region from where finance & patients are being drained continuously to different parts of the country. The Kashyap Memorial Eye Hospital’s endeavour lies in treating people not only from this region but also from different parts of the country. People from all walks of life have helped us a lot in making my father Late (Prof.) Dr. Bharat Prasad Kashyap’s dream come true. He started a general eye care clinic in 1966, who realized the grave situation of much greater prevalence of blindness in Jharkhand, Kashyap Memorial Eye Hospital into a NABH Accredited Superspeciality eye hospital and Internship training institute for BSC Optometry and a recognized center for All India Ophthalmic Society’s Academic research fellowship. All India ophthalmic society has now recognized our centre for fellowship and training for phacoemulsification in cataract surgery as well as for vitreous and retina. Our goal is to pay more emphasis to education and training the next generation ophthalmologists through fellowships and CME’s. The success saga of The Kashyap Memorial Eye Hospital lies in fast acquisition of Accreditation structure in quality and rapid adaptation of new technological advances. In India there are several accreditation bodies but the National Accreditation Board for Hospital & Healthcare Providers (NABH) was specially setup in 2005 under the Quality Control of India (QCI), to establish and operate accreditation programme for healthcare organisations from all stakeholders including the government, consumers and healthcare industry. QCI is member of ISQUA (International Society of Quality in Healthcare). We became the 1st NABH accredited eye superspeciality hospital of entire North, East & West India in February 2009. We kept the standard by getting reaccreditation in 2012. I dedicate The Kashyap Memorial Eye Hospital to the poor, needy and visually challenged people of this region & at the same I do hope that this hospital will fulfill the need of a quality Ophthalmic Teaching Centre across Eastern India. Greatness is on people’s mind now when they think about Jharkhand. Not only people from north east region but also from all four corners of the country people talk about Jharkhand’s contribution in many arena including health. We have grown from a general eye care hospital founded 48 years back in 1966 to The Kashyap Memorial Eye Hospital, a tertiary care eye hospital with latest technology, multi sub specialty capability, state – of – the art facilities, world class structure. Keeping abreast of the global standards in infrastructure, facilities, protocols and procedures, quality staff and faculty members well trained in their sub specializations at the best eye care institutes, we are now poised to reach the four corners of the country. For Hi-Tech Cataract surgeries hospitalization is not needed. Keeping in view our vitreoretina surgeries, ocular trauma surgeries, oculoplasty and squint surgeries, we have come up with 50 bedded hospital supported by highly trained para-medical and nursing team backed by 6 operation theatres of different sub specialties of ophthalmology, consultation suites and 24 hours ocular trauma service. We are proud to possess most advanced ophthalmic technologies ever developed, the Laser Cataract Refractive Surgery Suite the 3rd in India to help ensure accuracy at every step of cataract & refractive surgery. Combined with premium lens implants, with this new laser technology we can consistently deliver the refractive outcomes our patients desire. Vitreo retinal service is par excellence The surgical Retina department has state of the art surgical equipments in modular operation like CONSTELLATION ,the world’s number one micro incision fastest vitrectomy machine. Kashyap Memorial Eye Hospital is one of the very few hospitals in India providing this high end retina service to the patients. Kashyap Memorial Eye Hospital is the pinnacle of maximum perfection of surgical skill and dexterity, precision, team work and cutting edge technology to define new modalities of patient treatment. With the commitment of enriching the quality of lives of patients, combined with a judicious blend of technology, clinical expertise and personalized care, The Kashyap Memorial Eye Hospital’s mantra is to attain excellence in patient’s satisfaction. We continue to embody a 50 years tradition of eye care built by Late Bharat Prasad Kashyap who pioneered hi – tech eye care in state of Jharkhand in 60’s. © Copyright 2016 Kashyap Memorial Eye Hospital. ALL RIGHTS RESERVED.